"Starfleet Academy - Starship Bridge Simulator is a video game for the Super Nintendo and Sega 32X systems which was released in 1994 by Interplay, the same group which produced many later Star Trek starship games. It did not have a large following, as its interface was not considered easy to use, and had relatively simplistic game mechanics. Nevertheless, it marks a significant item in this genre, as it was a crucial prelude to the more widely known PC game Star Trek: Starfleet Academy, and to many of the more well-known starship games which followed. It was the first Star Trek computer game of significance to appear as a starship simulator in the modern age using graphics, after a long absence and decline in such games, during the decade following the age of text-based DOS games." 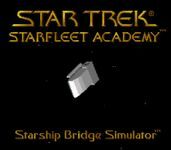 Source: Wikipedia, "Star_Trek:_Starfleet_Academy_Starship_Bridge_Simulator," available under the CC-BY-SA License.